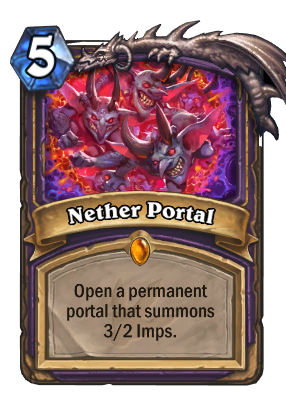 Is it possible to clog up the board by playing several copies of Nether Portal, like 7 to not be able to play minions anymore? Trying to link to this card elsewhere and can't. 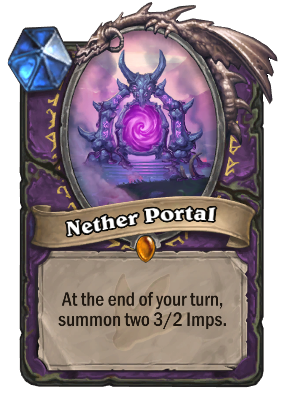 It says BBCode is Nether Portal but that links to the card that creates it. can i Silence this minions/else, with Mass Dispel or Silence? I remember in dark wanderer tavern brawl, if you completed all secrets, you were supposed to go against the cow king in the secret level. but before the cow king was summoned, a portal, kinda like the nether portal Enigmatic Portal that couldn't be targeted, i think , appeared. I've seen a streamer Sylvanas stealing the portal and so, the player became the cow king instead! Can you Mind Control Tech this? It's like a emblem in MTG, cant be targeted by removal (unless it says).